Hello all please help identify these hoses. The first routes into the firewall but i don't know what it's for. the second I'm pretty sure is for the smog/charcoal canister. i would like to remove them. my smog pump is bypassed and the cats removed. First hose no idea what it goes to. Second i would like to remove but not throw away. Ok the first pic is your vac check valve. That right vac line goes to the vac tree to supply vac to your HVAC system. The line going inside the firewall goes to the vac system(vac blocks) to the control knobs in the car. Left hose I believe goes to reservoir vac canister inside passenger tire fenderwell. thank you i think i can fix it all up. any idea where i could get these hoses? The local auto parts store will have the rubber hose and may have the hard plastic tubing. Advance Auto Parts seems to have all the stuff that is used with the hard plastic vacuum tubing. Code 85 - CANP solenoid - The Carbon Canister solenoid is inoperative or missing. Check vacuum lines for leaks and cracks. Check electrical wiring for loose connections, damaged wiring and insulation. Check solenoid valve operation by grounding the gray/yellow wire to the solenoid and blowing through it. The computer provides the ground for the solenoid. The red wire to the solenoid is always energized any time the ignition switch is in the run position. Charcoal canister plumbing - one 3/8" tube from the bottom of the upper manifold to the rubber hose. Rubber hose connects to one side of the canister solenoid valve. Other side of the solenoid valve connects to one side of the canister. The other side of the canister connects to a rubber hose that connects to a line that goes all the way back to the gas tank. 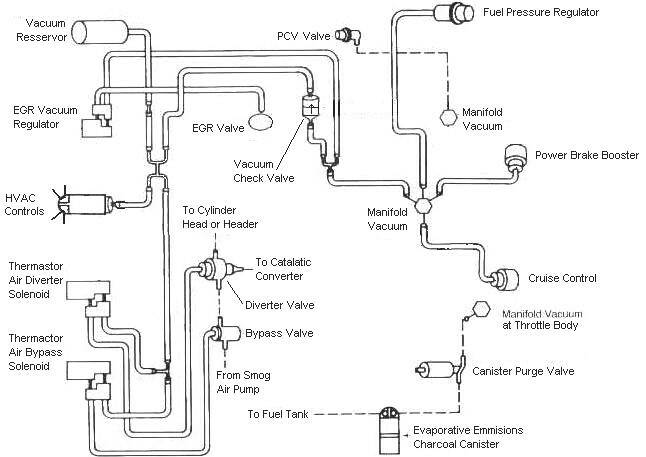 There is an electrical connector coming from the passenger side injector harness near #1 injector that plugs into the canister solenoid valve. It's purpose is to vent the gas tank. The solenoid valve opens at cruse to provide some extra fuel. The canister is normally mounted on the passenger side frame rail near the smog pump pulley. It does not weigh but a pound or so and helps richen up the cruse mixture. It draws no HP & keeps the car from smelling like gasoline in a closed garage. So with all these good things and no bad ones, why not hook it up & use it? The purge valve solenoid connector is a dangling wire that is near the ECT sensor and oil filler on the passenger side rocker cover. The actual solenoid valve is down next to the carbon canister. There is about 12"-16" of wire that runs parallel to the canister vent hose that comes off the bottom side of the upper intake manifold. That hose connects one port of the solenoid valve; the other port connects to the carbon canister. The purge valve solenoid should be available at your local auto parts store. The carbon canister is normally mounted on the passenger side frame rail near the smog pump pulley.